Offering comprehensive and up-to-date know-how in one compact book, an experienced editor and top authors cover every aspect of these important molecules from molecular recognition to cyclodextrins as enzyme models. Chapters include reactivity and chemistry, chromatography, X-ray, NMR plus other physicochemical methods, as well as model calculations, rotaxane and catenane structures, and applications in the pharmaceutical industry. The book also discusses other applications such as in the cosmetics, toiletries, textile and wrapping industries, agrochemistry, electrochemical sensors, and devices. A must for everyone working with these substances. Professor Dodziuk is working at the Physical Chemistry Institute of the Polish Academy of Sciences. She is interested in conformational analysis of hydrocarbons, classification of chirality, NMR spectra and structure of cyclodextrin complexes, endohedral fullerene complexes and carbon nanotubes. She has written more than 70 publications, several reviews and two books. 1 Molecules with Holes – Cyclodextrins (Helena Dodziuk). 1.4 Models of Chiral Recognition by Cyclodextrins. 2 Modification Reactions of Cyclodextrins and the Chemistry of Modified Cyclodextrins (Kenjiro Hattori and Hiroshi Ikeda). 2.1 Scope of This Chapter. 2.2 Modification Reactions of Cyclodextrins. 2.3 Chemistry of Modified Cyclodextrins. 3 Polymers Involving Cyclodextrin Moieties (Akira Harada, Akihito Hashidzume, and Masahiko Miyauchi). 3.1 Supramolecular Polymers Formed by Cyclodextrin Derivatives. 3.2 Supramolecular Complexes of Polymers Bearing Cyclodextrin Moieties with Guest Molecules. 4 Cyclodextrin Catalysis (Makoto Komiyama and Eric Monflier). 4.3 General Acid–Base Catalysis by OH Groups. 4.5 Catalysis by Chemically Modified CyD. 5 Chromatographic Studies of Molecular and Chiral Recognition (Monika Asztemborska and Anna Bielejewska). 5.2 Determination of the Stoichiometry and Stability of the Complexes. 6 The Application of Cyclodextrins for Enantioseparations (Bezhan Chankvetadze). 6.3 High-performance Liquid Chromatography and Related Techniques. 6.4 Super (Sub)-critical Fluid Chromatography. 7 Crystallographic Study of Cyclodextrins and Their Inclusion Complexes (Kazuaki Harata). 7.5 Molecular Recognition in the Solid State. 8 Microcalorimetry (Mikhail V. Rekharsky and Yoshihisa Inoue). 8.2 Application of Differential Scanning Calorimetry in Cyclodextrin and Drug Studies. 8.3 Application of Isothermal Titration Calorimetry in Cyclodextrin and Drug Studies. 8.4 Determination of Thermodynamic Parameters for Stoichiometric 1:1 Complexation by Cyclodextrin. 8.5 Determination of Thermodynamic Parameters for 1:2 Guest–Host Complexation of Cyclodextrin. 8.6 A Thermodynamic View for Globally Understanding Molecular Recognition. 8.7 Enthalpy–Entropy Compensation as a Practical Tool for a Global Understanding of Molecular Recognition. 8.8 Grunwald Theory on Enthalpy–Entropy Compensation. 8.9 Isotope Effect: Implications for the Comparison of Complexation Thermodynamics in H2O versus D2O. 8.10 A Theoretical Approach to Enthalpy–Entropy Compensation in Molecular Recognition. 9 NMR of Cyclodextrins and Their Complexes (Andrzej Ejchart and Wiktor Ko&zacute;mi&nacute;ski). 9.2 Application of NMR to Cyclodextrins and Their Complexes. 10.1 Introductory Remarks (Helena Dodziuk). 10.2 Mass Spectrometry of CyDs and Their Complexes (itold Danikiewicz). 10.3 Studies of Cyclodextrin Inclusion Complexes by Electronic (UV-Vis Absorption and Emission) Spectroscopy (Gottfried Grabner). 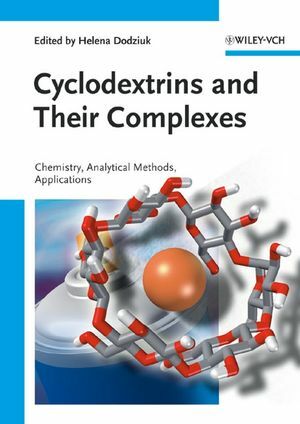 10.4 Circular Dichroism of Cyclodextrin Complexes (Daniel Krois and Udo H. Brinker). 10.5 Electrochemistry of Cyclodextrins (Renata Bilewicz and Kazimierz Chmurski). 10.6 Visualization of Cyclodextrins in Supramolecular Structures by Scanning Probe Microscopy (Masashi Kunitake and Akihiro Ohira). 11 Modeling of CyDs and Their Complexes (Helena Dodziuk). 11.3 Molecular Mechanics Cyclodextrin Studies. 11.4 Dynamic Simulations CyD Studies. 12 Rotaxane and Catenane Structures Involving Cyclodextrins (Konstantina Yannakopoulou and Irene M. Mavridis). 13 Large-ring Cyclodextrins (Haruhisa Ueda and Tomohiro Endo). 13.3 Isolation and Purification Procedures. 13.4 Physicochemical Properties and Structures of LR-CyDs. 14 Pharmaceutical Applications of Cyclodextrins and Their Derivatives (Kaneto Uekama, Fumitoshi Hirayama, and Hidetoshi Arima). 14.2 Some Characteristics of CyDs as Drug Carriers. 14.3 Improvements in the Pharmaceutical Properties of Drugs. 14.4 Potential Use of CyDs in Peptide and Protein Formulation. 15 Cyclodextrins in Dispersed Systems (Laury Trichard, Dominique Duchêne, and Améhot). 15.2 Dispersed Systems Involving CyDs. 15.3 The Potentialities of CyDs in Dispersed Systems. 16 Applications Other Than in the Pharmaceutical Industry. 16.1 Introductory Remarks (Helena Dodziuk). 16.2 CyD Applications in Food, Cosmetic, Toiletry, Textile and Wrapping Material Fields (Hitoshi Hashimoto). 16.3 Application of Cyclodextrins in Agrochemistry (Esmeralda Morillo). 16.4 Cyclodextrins in Molecular Devices (Renata Bilewicz and Kazimierz Chmurski).